A story is told about a man who was on a luxury liner and suddenly he falls overboard. He can't swim and in desperation he begins calling for help. Now it just so happens that there several would be rescuers on deck who witnessed the incident. The first man was a MORALIST. When he saw the man fall overboard he immediately reached into his briefcase and pulled out a book on how to swim. He now tossed it to the man in the water and yelled: Now brother, you read that and just follow the instructions and you will be all right. The man next to him happened to be an IDEALIST. When he saw the man fall overboard he immediately jumped into the water and began swimming all around the drowning man saying: Now just watch me swim. Do as I do and you will be all right. The person next to him happened to be a member of the INSTITUTIONAL CHURCH. He looked upon the drowning man's plight with deep concern. He yelled out: Now, just hold on friend. Help is on the way. We are going to form a committee and discuss your problem. And then, if we have come up with the proper financing, we will send you help. The next man on deck happened to be a representative of the school of POSITIVE THINKING. He yelled out to the drowning man: "Friend, this situation is not nearly as bad as you think. Think dry!" The next man on board happened to be a REVIVALIST. By this time the drowning man was going down for the third time and desperately began waving his arm. Seeing that, the revivalist yelled out: Yes brother, I see that hand, is there another? Is there another? And finally, the last man on deck was a REALIST. He immediately plunged into the water, at the risk of his own life, and pulled the victim to safety. When Jesus saw the vast crowd his heart was moved with pity for them, for they were like sheep without a shepherd; and he began to teach them many things. Jesus was moved with pity. This is a profound inner emotion. The intense feelings came from his witnessing of people’s plights. They were sheep without a shepherd. His heart felt for the people. His feelings for the people moved him to act. He began to teach them many things. This is a special character of Jesus. He is compassionate, and He cares. He has feelings for humanity. When Jesus saw Mary, Martha and the Jews wept over the death of Lazarus, he wept too (Jn 11:33). Jesus could not and would not pass through without taking actions to help people in need. Throughout the Gospels, there are multiple stories about Jesus healing, helping and defending people who cannot help or defend themselves. He saw a large crowd coming to him and he said to Philip, “Where can we buy enough food for them to eat?” (Jn 6:5). A centurion approached him and appealed to him to come to heal his servant lying paralyzed at home, and Jesus said, “I will come and cure him.” (Mtt 8:6-7). He saw Peter’s mother in law lying in bed with a fever. He touched her hand and the fever left her (Mtt 8:14-15). When the two blind men approached him asking him to heal their blindness, he touched their eyes and cured them. Mark reports that “Moved with pity” Jesus stretched out his hand to touch the leper and cured him (1:41). He told his disciples, “My heart is moved with pity for the crowd, for they have been with me now for three days and have nothing to eat. I do not want to send them away hungry” (Mtt 15:32). Jesus also makes it clear that God is not pleased with people who are careless and heartless. God is not happy with people who do not take actions to help others who are in need. The parables of the unforgiving servant (Mtt18:21-35), and the Rich man and Lazarus (Lk 16:19-31) and the last judgment of the nations (Mtt 25: 31-46) are lessons that Jesus wants us to remember and apply in our daily life. We do have feelings for others when we witness their plights. Like Jesus, when our feelings for others are strong and intense, we are motivated to take actions to help them. The difference is that Jesus knows what their needs are, and he is able to provide for them because he is the Good Shepherd. The Good Shepherd is the one who is after God’s heart. 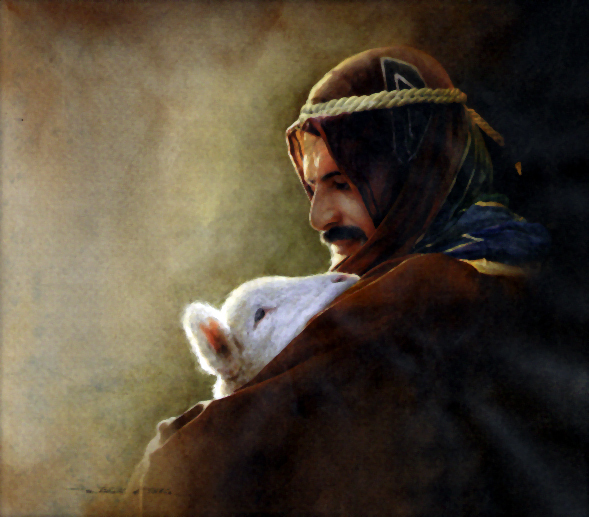 “I will give you shepherd after my own heart” (Jer 3:15). Our love and compassion for others must be generated from God’s love and compassion. Jesus always has our best interest in his heart. His desire is for us to be with him in his Father’s house forever. He wants to ease our pain so that we can walk faithfully and lovingly with God into eternity. We have many compassionate people around us, but many of them are misguided in their compassion. For example, pro-choice people claim that they care about other women. They care about poor women who cannot afford or do not want to have children. Therefore, they want to fight for women’s right to be protected with legal and safe abortions. Homosexual advocates argue that everyone has the right to marry and be happy. So they want to change the definition of human tradittional marriage between a man and a woman in order to show compassion to the homosexuals. Or Philanthropist Melinda Gates, a longtime advocate for women’s health issues, has feelings for poor women in Africa. She has been vocal in her support of contraceptive resources for women despite her Catholic beliefs. She has pledged to provide access to contraception for 120 million women who want, but cannot find, reliable access to contraceptives in the developing world. The Gates Foundation will contribute $560 million to African nations to fight high rates of unplanned pregnancy which result in extremely high mortality rates for both mothers and children along with a host of other social and health crises. This is misguided compassion. Their compassion is not compatible with Jesus’ compassion. Their compassion is not connected with God’s compassion because their compassion is not in communion with the teachings of the Church that Jesus Christ established. Melody Tan was in Junior high, she began to feel a passion to help those who were less fortunate. “I felt like I hadn’t accomplished anything to make my life worthwhile,” Tan said. “I hate seeing, hearing of, or even reading about people in pain or need.” In High School, she began to volunteer helping a group of Bhutanese refugees in the Houston area. She shared, “I was passionate about service, and the refugees’ story is an important issue because over a 100,000 people were forced to leave their home and go to the United Nations camps in Nepal. They’re a part of the Houston community now, and many of their needs aren’t those met by money, but by acceptance.” She began helping collect clothing, shoes, toys and household appliances for the refugees. After her freshman year At Rice University, she joined other students to travel to Guatemala for a two-week service project at the mission San Lucas Toliman. She said, “The most moving experience was learning about the history. I heard firsthand the story of a Guatemalan woman who traveled to Santiago to rescue 11 children who had been orphaned by the Guatemalan militia.” Moved to become involved in human rights advocacy and global health, Tan traveled to the Ecuadorean villages of Planchaloma and Quito in 2011 as an intern with the Rice’s Beyond Traditional Borders program which focuses on addressing health needs I developing countries. She said, “When I try to push aside my feelings for others less fortunate, I feel like I’m living a lie. As long as I can, and with whatever I have, I will try to make a difference.” She is a bioengineering major and global health technology minor. She wants to do work that combines her interests in medicine and engineering, while improving the quality of life in the developing world. (By Michelle Reed, Houston Chronicle, Tuesday, March 13, 2012). Moved with pity, Jesus gave his life to save humanity and he recruited you and me to continue his saving works here on earth. Is your heart moved enough to take actions for the salvation of the world? What actions do you want to make?